I got to go to school in a place that wasn’t North Dakota, Maine, Alabama, Rhode Island, Wisconsin, Minnesota, Oklahoma, Mississippi, Kansas, Arkansas, Oregon, Louisiana, DC, South Carolina, etc. I got to hear and see live some of the greatest music ever written and performed and got to see the evolution of recorded music from vinyl records, reel to reel, 4-track, 8-track, cassettes, CDs, MP3s, downloads, to the cloud. I knew that graduation from Bellflower High School would allow me to write my ticket for full happiness thereafter, having a leg up on all other high school graduates across this nation. Welcome to the Bellflower High Class Of 1972 web site! We are glad you have "come home" after all these years. 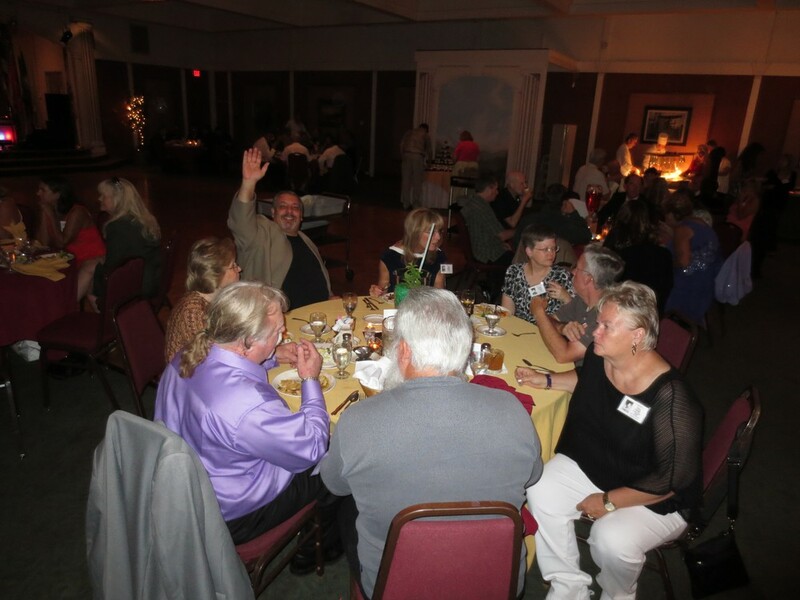 We loved seeing so many of you at our recent and epic 40-year reunion this past August 3 and 4, 2012! Please explore and enjoy this website dedicated to all of our classmates--those still with us and the many that are no longer with us. 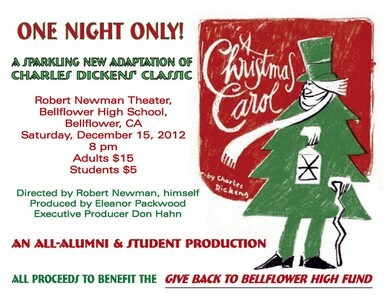 THE EPIC BHS PRODUCTION OF "A CHRISTMAS CAROL" OF DECEMBER 15, 2012 WAS A HUGE SUCCESS! LOOK FOR A RECAP AND PHOTOS SHORTLY! Dear BHS '72 Classmates -- Harry Bigelow Cason and the BHS '72 Give Back to BHS Committtee are back at it again! In addition to its previous contribution of $3500, the committee just gave Bellflower High School another $4500+ contribution. Your efforts at our BHS '72 40-Year Reunion auction activities and your reunion reservation donations make up the bulk of this new contribution. 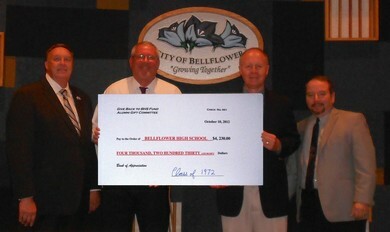 Together, the contribution to BHS from the BHS '72 Give Back Committee just this year is more than $8,000. We thank you for your generosity and for the great facilitation by Harry and the committee. This is a big deal! Dear BHS '72 Classmates: Here's the photo. I know [you] will want to see this. Left to right: Bellflower Mayor Dan Koops, BHS Principal Michael Lundgren, Give Back to BHS Committee Members Harry Bigelow Cason and Charlie Collucci. The Mayor and Mr. Lundgren sure were pleased at this, giving a very heartfelt thanks to all at the reunion who gave so generously. Plus, we presented Mr. Lundgren with a gift certificate for the Letterman's jacket, too. (making this total contribution at $4,532.00). Mr. Lundgren is gonna' have his Athletic Director pick out a worthy Sophmore or Junior kid to present the jacket to, so the kid can wear it proudly for years on campus and help build school spirit. He wants some alum lettermen on hand when the jacket is presented, for another photo op. Buncha' old "knights" welcoming a new one to the round table... I spoke to Dedic at the reunion and he's onboard. We'll get Daryl Koops - the guy who donated the money for the jacket - and other alum Lettermen together. It could be pretty cool..
Well done Harry and committee! What a couple of nights (plus a day for our golfers) we had. Our 40-Year BHS '72 Reunion is now in the books. The afterglow of feelings and comments by so many suggests that we nailed it! It was truly a team effort. There are so many great folks to thank--from all those heroes who planned, prepared and carried out the numerous moving parts required for such an exceptional 2-day, 3-event program, to all of those 100+ good classmates and guests who attended these memorable events and made them so extraordinary. As we "mature" as adults, the connections with each other seem that much sweeter with the passing of time. Of course, there is never enough time to do all the reconnecting we really would want to do. However, as Mayor Koops challenged us to "catch the lightning in a bottle" for our 40-year reunion while we could, there is a feeling of "mission accomplished." Perhaps our biggest regret was not having all of our classmates there, many of whom are on this website and could not make it for various reasons. You were missed, yet remembered fondly. On the fundraising side of things, check out the "Give Back to BHS" link on the left of this home page for the latest from its chair and classmate Harry Bigelow Cason. As for the future, a 50-year event was the pre-reunion target, but so many of you are now requesting a 45th. Let's see how things go the next little while and check in again with you to see if you would really like to do a 45th. If we do pull off a 45th, it would be fun to involve others of you who wanted to help this time but were not able to. Regarding the recapping of our 40-year reunion events, we have put a link on the left side of this website home page called "BHS 72 Reunion Recap." Feel free to click on it and have a fun look around. We need your help. Though we have captured some golf photos and have some Friday and Saturday night event photos, there may be more pictures that you have taken and we want to put them there. There were three events: 1) The BHS Golf Tournament, 2) the Friday Mingle Event, and 3) the Saturday Big Event. So as we continue to chronicle these three events, please send by separate email (eteynon@aol.com) photos you want to share from these three events, especially the Friday night mingle event as we have very few pictures currently. In the meantime, enjoy the "BHS 72 Reunion Recap" as it is a pretty good electronic history of our special time together. All the best, and, as always, we are operating under the wise and benevolent guidance of the big kahunas, Mara and Kerry. Thanks for a very special time, Ed Eynon. "War of the Worlds" DVD is Now Available for Purchase!! "War of the Worlds" DVD is Now Available for Purchase!! ? War of the Worlds DVD--Ready for Purchase! 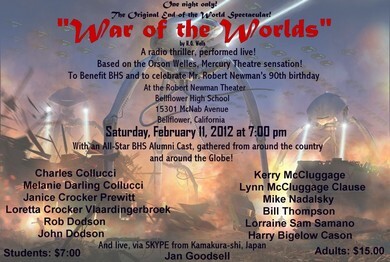 This February there was a gala, once-in-a-lifetime benefit performance at Bellflower High School, in the Robert Newman theater, to honor Mr. Newman on his 90th birthday. A group of alumni gathered to perform H.G. Wells’ classic thriller “War of the Worlds”, the famous radio play, originally presented by Orson Welles and the Mercury Theater of the Air. That Bellflower High performance was captured on video, on multiple cameras, with superb sound, and has been edited together for your viewing pleasure. It is now a DVD that is for sale, with all proceeds going to benefit Bellflower High. THE CAST: Edgar Bullington, Harry Bigelow Cason, Charles Collucci, Melanie Darling Collucci, Rocco Collucci, Janice Crocker Prewitt, Loretta Crocker Vlaardingerbroek, Rob Dodson, Jan Goodsell, Kerry McCluggage, Lyn McCluggage Clause, Mike Nadalsky, Bill Thompson and Lori “Sam” Samano. No Cash, please. Make the check payable to Bellflower High School. WE SING OUR PRAISE TO THEE. WE PRAY TO KEEP YOU FREE. WE PLEDGE OUR HEARTS TO THEE.